Upon being commissioned to create a new orchestral piece for the Seattle Symphony, composer and clarinetist Angelique Poteat, who turns 29 this month, immediately set to work immersing herself in the oeuvre of her musical inspiration: Pearl Jam. The completed piece, Beyond Much Difference, will premiere this month as part of the symphony’s popular Sonic Evolution program, which presents new compositions based on work by Seattle music legends. Past shows have included work inspired by Jimi Hendrix, Ray Charles, Bill Frisell and Sir Mix-A-Lot. Also on this month’s bill are world premieres by French composer Yann Robin, whose piece Ashes is rooted in Nirvana, and guitarist Mike McCready, whose piece Waking the Horizon is based on his decades spent with bands such as Mad Season and Pearl Jam. All the composers, however, are specifically prohibited from “quoting” any recognizable strains (so if you’re hoping to hear a strings version of “Jeremy,” think again). Instead, the task is a much more creative challenge: Deconstruct the band’s music and put it back together in a way that reflects all of its elements, but sounds entirely different. It’s a tall order, especially for a relatively new composer. Poteat, who now lives in Greenwood, grew up near Maltby and on Whidbey Island with a mother who liked country western music and a father who preferred rock. “But if I had control of the radio,” she says, “I’d always turn it to classical.” She ascribes her early interest in part to the 1992 HBO kids’ movie Beethoven Lives Upstairs (“It stuck with me,” she says, a bit bashfully) but more importantly, to being exposed to classical via the music program at her public elementary school. As early as age 8, she started writing songs—usually two-part compositions exhibiting “a Baroque flair”—on a Casio keyboard at home. 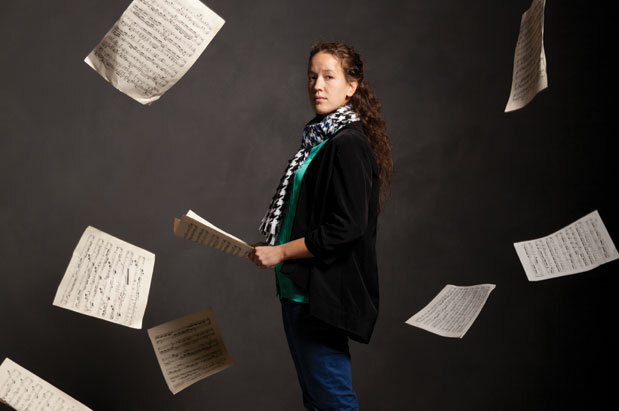 Poteat, who plays clarinet in several orchestras, including the Seattle Modern Orchestra and Yakima Symphony Orchestra, is currently at work on another new piece, for which she recently earned a City Artist grant from Seattle’s Office of Arts & Culture.